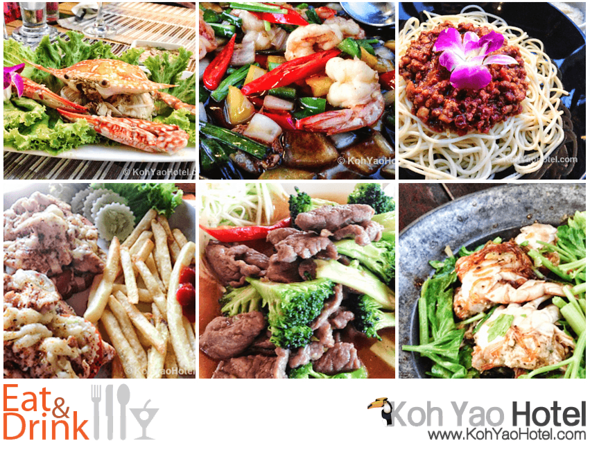 (Please see the Koh Yao Noi map for the location of each of these restaurants). Koh Yao Noi village has Je T’Aime, a great French and Thai cuisine restaurant. There are several cafes and street food sellers here too, including Cafe de Iraya, which sells real coffee with fresh milk. Good View restaurant is in the perfect location to enjoy Koh Yao’s spectacular sunsets. It’s down a fairly steep flight of stairs onto the beach, but it’s worth the effort. Pasai Beach has Rice Paddy, a nice Thai restaurant and ice-cream parlour, two al fresco seafood restaurants right by the beach – Pasai Seafood and Pasai Corner – as well as Baan Chang, another seafood joint, and a nameless beach restaurant at the northern end that sells pizzas, Thai food and cold beer. Klong Jark beach has Villaguna restaurant, Pyramid restaurant, Green coffee shop and Sabai Corner restaurant on the southern strip. The ship-shaped Para Bar is just beyond Klong Jark beach, serving strong cocktails and bar snacks. Chan restaurant sells tasty Thai food and can be found in northern Klong Jark, just past Six Senses resort. La Luna Pizzeria delivers pizza direct to your Koh Yao Noi resort, or you can visit them at their restaurant just beyond Tha Khao Village. La Sala, at Koyao Bay Pavilions, is a well-regarded upmarket restaurant in this secluded resort which is perfect for a special occasion if you want to splash some cash. Lobster Seafood is worth the fairly long drive to get there along from Lamsai Pier just for the magnificent setting, perched on the cliff edge overlooking the sea. You can see all Koh Yao Noi restaurants reviewed and rated on TripAdvisor.